ST. LOUIS — One of the few drawbacks of disappearing for spring training ever February is that all of those coupons and gifts certificates that stack up around Christmas with March 31 expiration dates have to be used before Valentine’s Day. That includes golf. Even in this weather. And so it was this afternoon that I found myself looking down Normandie Golf Club’s No. 15 looking for the best liver spot of mud to stick my tee — sploorch! — and watching as my breath became a cloud. Temps were dipping below 40. My score was rising toward 100. But historic Normandie, the oldest course west of the Mississippi River still on its original footprint, was the place to be on a January afternoon with rain in the evening forecast. After all, we had a coupon. Golf is not my game. In the family sports lottery, my dad claimed this 18 holes of torture. I got swimming, grandpa got basketball, my eldest cousin took cycling, his son grabbed hockey, and so on. The boy wonder is on the clock. We all share baseball. With my vacation days dwindling and spring training wiping out my March, this was the day my dad and I could hit the course and use a coupon that expires sometime during spring training. The weather … could have been worse. The temp at first tee was 43 degrees. We couldn’t see our breath until the back nine. It didn’t rain until an hour or so after we were done. The greens were unforgiving, our drives didn’t have distance, and pop’s game didn’t really loosen up until his muscles did around No. 8. That allowed me, for the first time in at least a decade, to hold a lead as we made the turn. I’d like to thank my putting for making this lead possible. It didn’t last. I don’t play golf enough to be frustrated by my inconsistency. That doesn’t stop me. Getting length on my shots has never been the problem — especially around the green when it comes to the short game. No, distance isn’t an issue. Direction is. My drives slice. So, I go through all these machinations to limit the amount of time I spend searching in the woods or on neighboring fairways for drives that have Frisbee’d right on me. Aim 9 degrees to the left of where I’m going. Close the head of the club. Flex elbows. Straighten feet. Grit teeth. Get a good curse word ready on the back of the tongue. Sometimes it works. Today it worked as well as possible because the cold weather meant everything was a little less, a little stiffer. The ball flew less far. The slice was less right. The putts were less swift. The best example of this refrigerator effect on my usual troubles wasn’t the 2-stroke lead I had after nine but the fact that I didn’t lose a ball until teeing off on No. 11. That shot sailed right and right into a wilderness. I lost my next ball with my next swing. Same slice. Same wilderness. Just a little deeper into it this time. But that was it. Those were the only two balls I lost. As dusk settled over us and the temperature dropped closer to Lambeau than Augusta, I stumbled at times on the back nine — a three-putt on a par 3 is particularly horrifying — and watched my dad pull away for the win. I, however, remained focused on the score that mattered. I played 18 holes and lost only two balls. And you know what that means? Why, that’s eight under par. Best. Round. Ever. 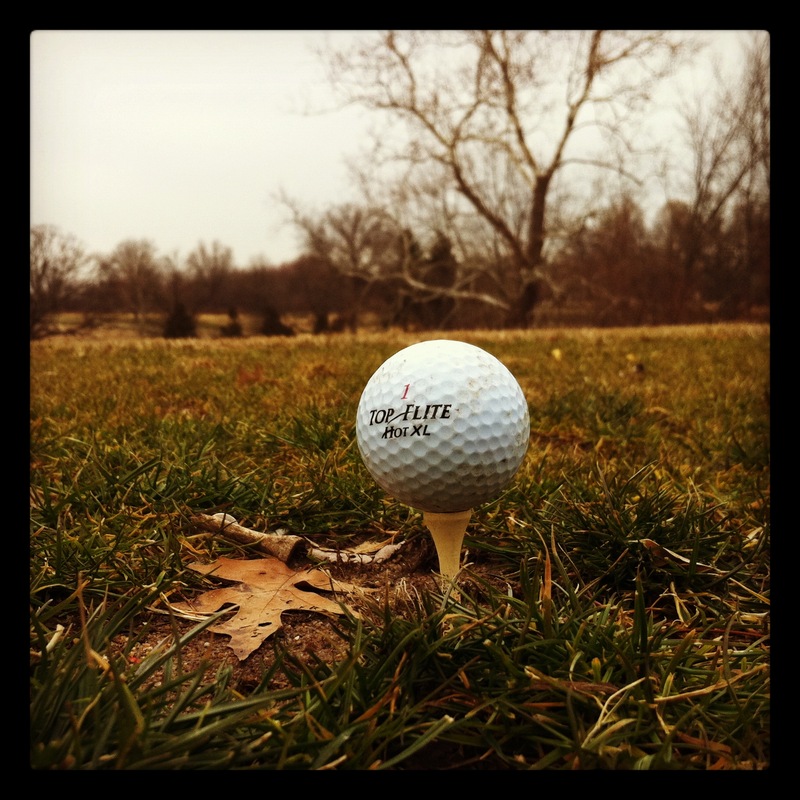 This entry was posted in journal, project 365+ and tagged golf, normandie golf club, spring training by dgoold. Bookmark the permalink.